Autres informations Description: This 4-knife pull-thru delimber comes equipped with an integrated topping saw. It is suited for use in hardwood or pine. The 72" wide throat opening, a special roller, and our unique knife design makes delimbing trees smooth and easy. It comes mounted on a cradle constructed of high alloy steel. We also use top quality rotation bearings, pivot bushings, and rollers. Its ease of operation yields maximum production. •The new curved, slanted, and rolled tubing frame makes the 264-Ultra the easiest loading and most productive pull-thru delimber built today. •The 264-Ultra design sheds limbs and bark eliminating messy build up for you to contend with. •The addition of a central grease station, and the enhanced outboard roller adjustments make service and maintenance easier than ever. •CSI continues it's tradition of building delimbers tough, and rugged to meet the demands of high production logging operations. 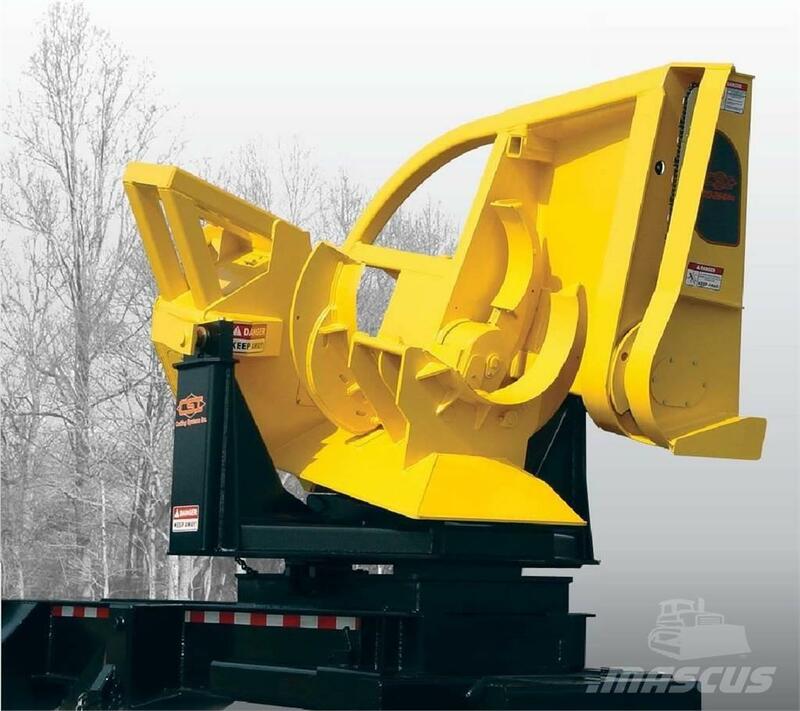 The 264-Ultra is also available in a left hand model that is used in tandem loader operations and with certain loaders which have booms that are to the left of the operator's cab. When used in these applications the 264-Ultra Left Hand version ensures a constant even flow of product and maximizes the return on equipment investment. • 72" Throat Width, Allows For Easy Loading. • Professional Rolled Tubing, Designed To Promote Easier Loading. • Purpose Designed Roller, Ensures Easy Pulls Every Time. • 4 - Knives, Made Of Hi-Alloy Wear Hardening Steel, For Long Life. • Strong Roller Adjustment, Designed For Easy Maintenance Access. • Cam Chain Adjuster, Simplifies Routine Maintenance. • Completely Constructed With Hi-Alloy Steel. • Strong Rotation Bearing Bolts, (3/4 L-9). • Strategically Reinforced Joints For Maximum Strength. * Larger diameters accomidated, but not completely incircled. Our PTD-264-NTS is designed with the same rugged features and quality as our PTD-264, without the integrated topping saw for operators who do not require that option. Sur Mascus France, vous pouvez trouver un/une autre CSI PTD264 ULTRA. Le prix de ce/cette CSI PTD264 ULTRA est de - et il a été fabriqué en 2018. Cette machine est visible sur Hickory, Mississippi en/au États-Unis. Sur Mascus France, retrouvez des CSI PTD264 ULTRA et bien plus de modèles de autre.